Following on the heels of the Manhattan, here with go with probably the most well-known classic cocktail: the Martini. This is an iconic drink that has been destroyed by the flavored vodka world. I’m going to leave that alone and just move on. The modern age has also dried Martinis out to the point where you are pretty much just getting a chilled shot of gin. While I like gin, the Martini is such a better cocktail than that. 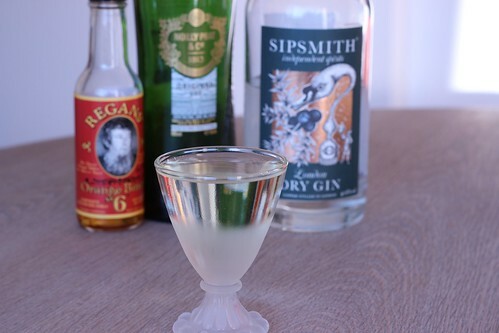 The Dry Martini uses dry (French) vermouth, which is the classic that people refer to today, and is the original concoction. You also have the Sweet Martini as well though. It just uses sweet (Italian) vermouth instead. For completeness, there is also the modern Perfect Martini, called a Medium Martini back in these books, which uses equal parts dry and sweet vermouth. OK, let’s just get this out of the way. I’ve no idea what Axel meant by “sauce” (Danish: sovs) in this recipe. Classic sovs in Denmark is a brown gravy. The best guess I could come up with would be more like Worcestershire or HP sauce. Still doesn’t really make sense, and I don’t have it in me to try anything sauce-like in my martinis. This may just be a mystery for the ages, and I’m happy to ignore it. Martinis are really simple, and just like the Manhattan, it’s all about the ratio of spirit to vermouth. Savoy has 2/3 gin and 1/3 vermouth instead of half and half. They do also list an Extra Dry Martini, which uses 2 oz. of gin and 1/4 oz. of dry vermouth, so an 8 to 1 ration (instead of 1 to 1, or 2 to 1). Café Royal is only 2/3 and 1/3 for the Sweet Martini, while half and half for the Dry. Neither Café Royal or Savoy add bitters to their recipe, which I think is a real shame. If you like gin drinks, but find Martinis a bit too much, I highly recommend that you play with your gin/vermouth ratio. It’s what made me finally like Martinis. It’s perfect for me at 3 to 1 (3/4 gin to 1/4 vermouth). For reference the modern, official IBA recipe is 6 to 1. Once you know the ratio you like you can always order that way instead of hoping the bartender doesn’t just wave the vermouth bottle over your glass. You may also find that you actually like a Sweet Martini as well. I’ll admit that I change which gin I used the Dry and Sweet versions. I used Sipsmith for the Dry, which has a more delicate flavor (and maybe my favorite gin), and I used Tanqueray 10 with the Sweet. The citrus flavors and more backbone to it play well with the sweet vermouth for me. Certainly something else to play with in a Martini once you sort your ratios out. I quite like both the sweet and dry versions of this, but I have to admit that when I think Martini, I’m craving a Dry Martini. Now that I know my preferred ratio I can even order a Martini out at a bar and enjoy it.